Five Singaporeans and three Bangladeshi workers have produced the latest home-made music video making its rounds on social media in Singapore. Featuring a cover of Fun. 's Some Nights, with a mix of My Chemical Romance's Sing, the fascinating — and possibly pioneering — collaboration is titled straightforwardly as "Some Nights/Sing - Fun. & MCR - A cover by Dots and Forest feat. OJG". The effort combines typical instruments like the electric and acoustic guitar, bass, vocals, small drums and the cajón with other interesting ones like a thumb piano, a singing bowl and even a gigantic water bottle. The idea for the collaboration first came to freelance photographer Bernice Wong, 24, who initiated the project at a music session to which she was invited. Organised by Bangladeshis who live and work here, the hour-long sessions take place in the evenings at a recreational space in Little India known as Dibashram. Wong, who had for some time been volunteering with TWC2, enjoyed it so much she decided to call a couple of friends to check them out as well. "It was a very nice atmosphere, I really liked it," said Wong, speaking to Yahoo! Singapore over the weekend from Bangladesh, where she is currently shooting a photo series on young mothers. "So I thought, okay, why not let more people know about it?" 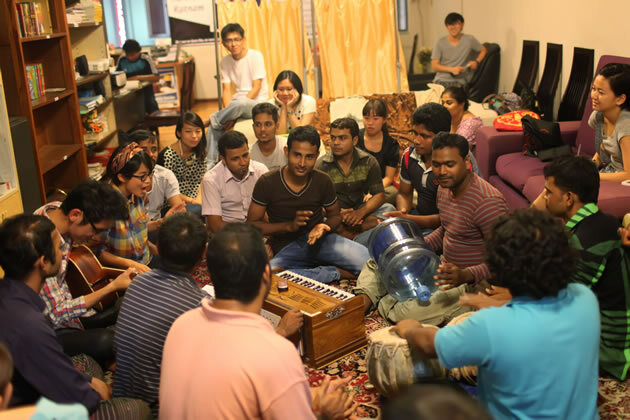 So in July, 20 Singaporeans and about 20 Bangladeshis came together for a jamming session of sorts at Dibashram, including the people who took part in the eventual collaboration, and they were so impressed by the talent that the Bangladeshi musicians had that Wong decided they could possibly shoot a music video from it. With that, Wong approached her friends Moxi Looi and Chen Guan Xian with the idea, who in turn roped in three others — Sky Ong, Renny Goh and Xin Ang — on the project. 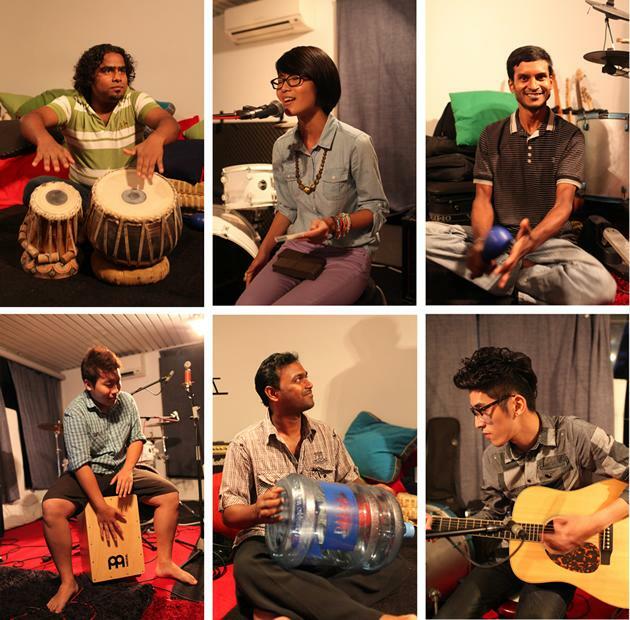 Wong also asked along three Bangladeshi musicians she met at the music sessions — Jahangir, Getun and Osman, who delightedly accepted. She first went to 26-year-old Jahangir, whose wife's home she visited in Bangladesh to profile their love story previously, and he then roped in his friends Getun and Osman, who play frequently at Dibashram. "Osman and Jahangir play really regularly so I knew I could count on them," said Wong. "Jahangir asked Getun along to play the maracas, and we were more than cool about it!" she added. The shoot date was set for August, and after a half-hour rehearsal at Ong's home studio, with Looi, Chen and Ong working through the arrangement, the session was recorded and a music video was made, over about three hours. 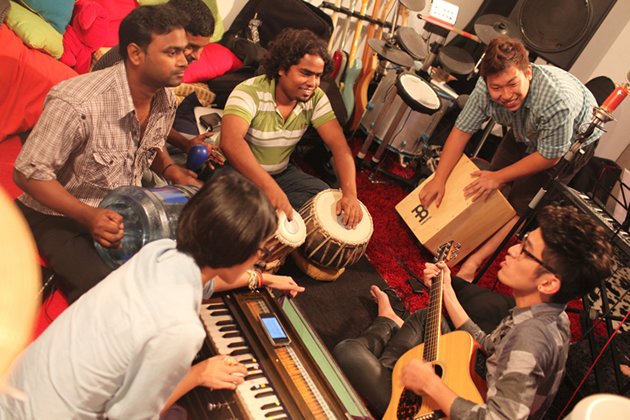 The Singaporean musicians later gathered on a separate occasion to add more layers of vocals and backing instruments. On the seemingly-short rehearsal time they had, Wong said, "I guess you could say that we were really confident of pulling it off... I think if you are really good percussionists, you could get into the groove fairly easily!" She added also that it was "actually really easy" working with Jahangir, Osman and Getun, whom she said engaged in active discussion and collaboration on how to fit and arrange various parts of the songs. "I don't think it was a one-way session — it wasn't like a we (Singaporeans) direct you (Bangladeshis) kind of thing — we had dialogue, exchanges and discussed how we thought it could all fit in... so it was really open communication for us all," she said. Wong said Looi, Chen and Ong were responsible for their choice of songs, as well as for working through the musical arrangement of the eventual mash-up. "We wanted something upbeat, catchy; something we could all groove to," she said, explaining their choice of Some Nights. Further, lines in the chorus for Sing were also very meaningful, in particular "Sing about everyone that you left behind", which she said referred to Jahangir's, Osman's and Getun's loved ones back home. Asked about his experience working with Wong and her friends, Jahangir, who spent six years here as a shipyard worker, told Yahoo! Singapore he felt "really lucky" to be a part of the project. "It (the experience) was very nice, and (something that) not everybody can do — the lyrics were very nice, and my family was very happy to see the video on the internet," he said. Jahangir, who suffered slight injuries to his backbone after a six-metre fall at work, will be heading home in the middle of this month after collecting his injury compensation. Speaking more about the project, he said that the songs were both very meaningful to him, Osman and Getun as well. "Singapore boys and girls are my brothers and sisters," he said. "I see no difference between Singapore(ans) and Bangladesh(is) -- we are all friends, and (the Singaporean musicians I worked with) are all very nice." The Fun./MCR mash-up project falls under a larger one known as "Beyond the Border, Behind the Men", initiated by Wong and two of her friends — 26-year-old Joses Kuan, who works with a regional non-governmental organisation, and 24-year-old freelance videographer Ng Yiqin. Referred to for short as "BTBBTM", Wong says the project aims to bring into focus and celebrate the Bangladeshi workers in our midst. "We wish to celebrate their resilience, spread stories of cheer and inspiration, and pay tribute to the human spirit... on a very fundamental level, we are all equals," she said. The trio are working on holding a photo and short-film exhibition toward the end of the year, in conjunction with International Migrants' Day on 18 December, and have further ideas to produce a short film on Bangladeshi workers here, a melodrama and possibly more activities to bring Singaporeans and Bangladeshis together. In the meantime, Wong says she has a simple point to make in the work. "I think what I really wanted to show was that our migrant friends are really talented and that we (Singaporeans) can work together with them as well."